NetherRealm Lead Ed Boon has started an unofficial survey asking fans to pick DC characters for Injustice: Gods Among Us. It's barely been more than a month since the release of Injustice: Gods Among Us, but the game has already established a healthy base of players eager to pit their favorite superheroes and villains against each other in combat. 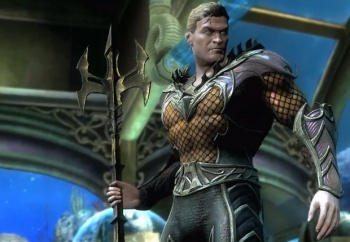 While the game's initial cast included twenty-four different characters from across the DC universe, the selection left some unsatisfied as their personal favorites didn't make the cut. To try and remedy some disappointments, the game's developer, NetherRealm Studious, has been hard at work readying DLC to add new fighters to the game. The teams efforts have already begun paying off. The Superman villain Lobo, was made available on May 7th, while Batgirl should also be up for grabs in the near future. These two aside, there remains a whole plethora of heroes and villains fans want included in the game. Perhaps hoping to narrow the options down a bit, NetherRealm lead Ed Boon recently asked his Twitter followers to take an unofficial survey about which characters they'd next like to see added to Injustice. The survey included as choices: Blue Beetle, Doctor Fate, Powergirl, Red Hood, Static Shock, Swamp Thing and Zatanna. When asked by one of his Twitter followers why Justice League of America member Martian Manhunter wasn't on the list, Boon replied that the superhero would automatically take the number one spot and that he "Was more curious about remaining characters." While the characters included in Boon's survey are arguably diverse, it's still a short list when you consider the breadth of the DC Universe. The inclusion of Red Hood could also be seen as a tad unnecessary considering the fact that six Injustice fighters, not including Batgirl, already hail from the grim streets of Gotham.